In September 2014, APA's Planning and Community Health Center was awarded a three-year grant from the Center for Disease Control and Prevention's (CDC) Division of Community Health, launching a major new project: Plan4Health. From September 2014 to September 2017, APA Chapters and American Public Health Association (APHA) Affiliates worked with communities across the country to integrate planning and public health. Partnering with local nonprofits, universities, residents — and others across a range of professions — coalitions worked to increase opportunities for physical activity and increase access to healthy foods. "Plan4Health was a completely new type of project for APA — and an exciting opportunity to go beyond simply encouraging our members to think about health by actually providing financial support for them to partner with peers from multiple sectors to implement change." The 35 coalitions strove to prevent chronic disease at the neighborhood, city, county, and even regional levels. Responding to needs identified by community members and leveraging local assets, Plan4Health grantees reached nearly 4 million residents through the implementation of policy, systems, and environmental improvements. The final iteration of the project — Planners4Health — furthered the integration of planning and public health at the APA Chapter level. 28 participating task forces worked over a six-month period to conduct assessments, convene stakeholders, and develop action plans for advancing healthy planning with their members. 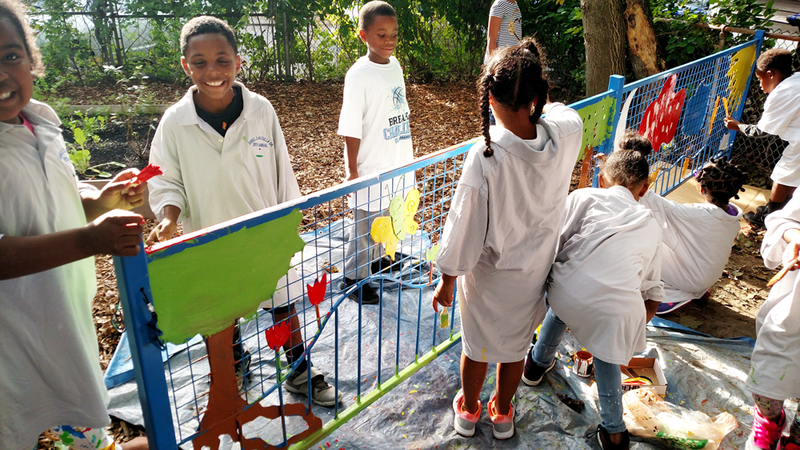 A neighborhood-level project, students from Vincent Brown Rec Center paint the teaching garden fence in Rhode Island. Photo courtesy Mount Hope Coalition to Increase Food Security. Plan4Health proved to be a catalyst for change at the local level. But, how do we continue this momentum? How could more communities replicate coalition strategies? Training and technical assistance were key elements of the Plan4Health project. From peer calls to webinars to workshops, Plan4Health communities were supported in their efforts — and tools developed for Plan4Health are now available to all APA members. Selected webinars are currently being offered for on-demand continuing education credit, making it possible to learn directly from local communities and national partners. As a part of Planners4Health, the Planning and Community Health Center released a free, interactive online course. Introducing five components of healthy planning, the course offers a grounding in skills that accelerate community-based change. Plan4Health regional meeting in Baltimore. Photo by Matt Makara. Complete the Planners4Health curriculum. A five-part webinar series, also available for on-demand continuing education credit, the curriculum is designed to complement the online course and to showcase Plan4Health coalition experiences. While webinars offer one pathway for learning, the 2017 Plan4Health toolkits share coalition experiences through the lens of three focus areas: active living, food systems, and health in all planning policies. Not the usual dense package of prescriptive steps, the Plan4Health toolkits are an entry point into this complex project. Interested in learning more about an innovative active living approach? The active living toolkit highlights the biophilic design work of Iowa and the Active Living Index of Wisconsin — and links you to the Plan4Health website, which has become the project database. Each coalition has a page dedicated to its work, including final reports and media products. Not sure you are up for scrolling through webpages? The Peer Learning Network offers mini-webinars, videos, and podcasts — making it easy to learn from a colleague (in five minutes or less). The impact of Planners4Health has yet to be determined. The final project meeting during the 2017 Policy and Advocacy Conference provided a preview of what the 28 chapters have accomplished. From the interactive Story Maps of New Mexico to the working groups of Pennsylvania, chapters across the country are identifying strategies to integrate planning and public health in their communities. While the official project period has come to a close, Plan4Health and Planners4Health experiences will continue to be part of the Planning and Community Health Center and APA. Coalition and chapter success stories will be released throughout 2017 and 2018 via APA's blog and website. The first Plan4Health case study was published in July 2017, with more to come later this year. 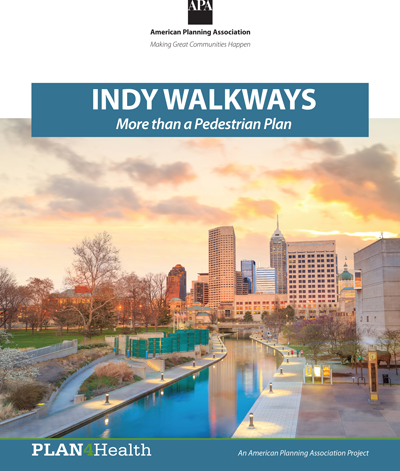 Indy WalkWays: More Than a Pedestrian Plan is Indianapolis/Marion County, Indiana's first pedestrian plan, impacting the county's more than 940,000 residents. Health by Design leveraged Plan4Health funding and community partnerships to develop the plan, which was adopted by the Metropolitan Development Commission in May 2016. Throughout Plan4Health, APA was also part of a national coalition: Partnering4Health. The impact of the national partnership between the American Heart Association, the National WIC Association, the Society for Public Health Education, and the Directors for Health Promotion and Education is captured in the recently released white paper. A combination of summary documents and strategy pull-outs, the white paper is designed to contribute to the ongoing movement to support healthy communities through national associations. In addition to the white paper, an online course on sustainability is available. Incorporating lessons learned from Plan4Health and others, the course is an interactive guide to supporting local coalitions in their ongoing efforts to prevent chronic disease. An accompanying toolkit is offered as well. The Partnering4Health website houses the white paper, online course, and additional resources to advance this work. Interested in connecting with like-minded planners and public health professionals? Join APA's Healthy Communities Collaborative (HCC). The HCC is an interest group dedicated to advancing the healthy communities movement. Top image: Partners share ideas on planning and public health at the New York Metro Planners4Health roundtable. Photo by Anna Ricklin.